Wear this waterproof Toe Warmers boot and get the protection you need from the cold weather elements. 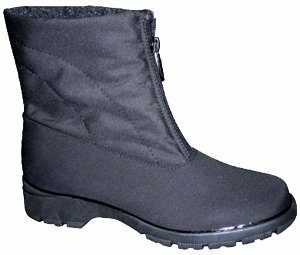 The boot is built to keep the cold out and the warmth in with a cotton polyester, waterproof upper and insulated Milano lining. The bellow tongue behind the easy-access front zipper adds an extra layer of warmth and added protection from water and cold conditions. Durable, flexible TPR outsole keeps you steady in wet conditions. The foam insole and fiber board midsole provide superior cushioning, shock absorption and support. The steel shank supports and stabilizes the foot through heel strike to toe off. A full toe box provides wiggle room for your toes to spread out. The front zipper allows easy access. Waterproof cotton polyester upper and bellow tongue keep water out, so your feet stay dry. Milano (knitted polyester) upper lining helps keep your feet warm. Thermoplastic rubber outsole provides traction and remains flexible in cold conditions. Cotton polyester upper, Milano knitted polyester upper lining, felt sockliner, foam insole, polyethylene foam, fiber board midsole, steel shank, thermoplastic rubber outsole. Heel Height: 1". Shaft Height: 6". Care: Wipe off with a damp cloth. If you have any questions about this product by Toe Warmers, contact us by completing and submitting the form below. If you are looking for a specif part number, please include it with your message.